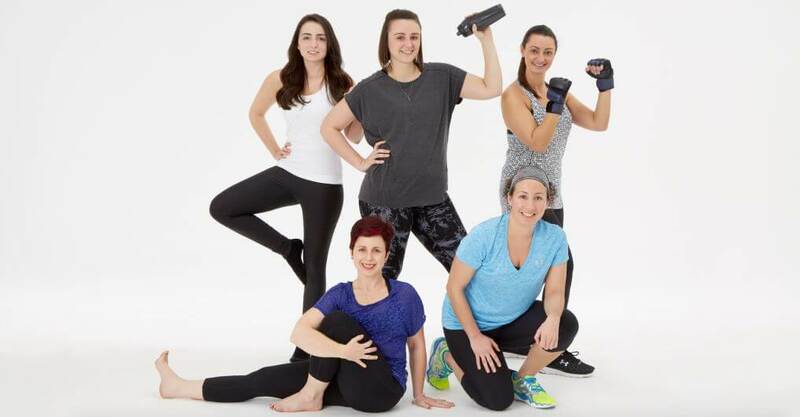 With fitspiration as its annual peak, we’re bringing you an inside look at five of the hottest fitness trends for 2016 that our staffers are all about right now—not to mention the corresponding activewear trends. Because when the elliptical starts to feel like a snooze, you definitely don’t have to default to the couch! Her fitness trend: Pure Barre. I’ve been going five days a week for over a year. With Pure Barre, there are no distractions like at the gym. You’re constantly pushing yourself, and everyone around you is, too. The scoop: It’s like a Pilates-ballet mash-up. When you arrive, you put on sticky socks, which are essential. Then you grab a ball, weights and a resistance tube and find your favorite spot on the barre. After warming up, you work three zones: thighs, seat, abs. The class is comprised of different moves, so you never take the same class twice. Why it’s so addictive: You get toned, sleek dancer-type muscles, and it makes you feel graceful and confident. You need to clear your head and concentrate, which is great after a long day. It also targets every problem area. Barre changes your entire body with the smallest motions. Biggest challenge: Being on tiptoe for almost an hour! It takes getting used to; I still struggle sometimes. When you have to pull off the barre into a squat on the balls of your feet…I can’t even think about it without getting exhausted! Best suited for: Everyone. It’s so different from every other class out there, and something you need to try to understand. Highlight: The results. I was never able to do a split in my life until now! The motto is “you’re stronger than you think,” and that motivates me. Unofficial uniform: Hard Tail Tear Drop Shelf Bra Knit Tank, Nike Legend 2.0 Dri-FIT Leggings and sticky socks. Favorite sports bra: Under Armour Mid Control Sports Bra. I love the adjustable straps. On balance: It’s not easy, and I’m not perfect, but committing to a well-rounded lifestyle helps. I choose to make it a priority. Secret of life: I’m always looking on the bright side. It’s the best way to keep stress and doubt from stopping you from having everything you want. Passionate about: My friends joke that if there’s a cause to fight for, I’ve already started. I volunteer year-round at a food bank and animal sanctuary. On empowerment: It’s about having—and being—an unwavering support system. You could change someone’s life. Best beauty product: After a workout, Mario Badescu Rosewater facial spray keeps my skin clear and refreshes my hair. Style signature: I almost always have on small pearl earrings. They make me feel put-together. Words to live by: “Change your thoughts to change your world.” When I’m unmotivated, it puts things into perspective. Her fitness trend: Real Ryder spinning classes. It’s like traditional group spin in that you vary your speed and resistance, but these bikes lean and tilt back and forth so it’s more like riding outdoors. It engages your core and gives more of an upper body workout than riding usually does. I try to go once a week. The scoop: A class of about 8 of us does hills and sprints to Top 40 music chosen for beats per minute. We coast to warm up. The instructor tells you when to lean left or right to “turn,” or when to crank it up and get off the saddle. There are three main positions you return to. There are interval classes, climbing classes and more. The place I went to previously had Britney Spears night. Why it’s so addictive: It feels like dancing more than it does a workout. It’s like a club in there. It’s all about the playlist, the vibe. Major motivation: To get my heart rate up and have fun. The “fun” aspect is what keeps me coming back. Biggest challenge: Some days, it’s just exhausting. The bike took some getting used to—I had motion sickness at first. Best suited for: Anyone, especially people who like cycling. Highlight: The instructor who played a soundtrack of people cheering for us. Unofficial uniform: Calvin Klein Performance Keyhole Back T-Shirt and Smoke Print Cropped Leggings. Favorite sports bra: Calvin Klein Medium Control Wire-Free Racerback. Secret of life: I try to do what makes me happy. Passionate about: Family, friendships, discovering who I am. On empowerment: I’m 100% feminist to a fault. Current obsession: Adele. Who isn’t obsessed with her? Style signature: My blue eyeglasses. Last book read: The Martian. Best beauty product: Lush Bath Bombs. Relaxing in the tub after class soothes sore muscles. Her fitness trend: Kickboxing. I heard from several people how awesome it was. I took a free trial class ten months ago and was hooked. I usually go three times during the week and once on the weekend. The scoop: There are about 15 people per class, which always starts with stretching and a few laps around the gym. Then you start throwing punches on the bag. The instructor calls out combinations, and you follow along. In between, we do squats, planks, running and weights. It’s a lot of cardio and strength training. Why it’s so addictive: I always leave there feeling awesome. Since I started, I have more energy, my clothes fit better and it makes me second-guess my eating—I don’t want my hard work going to waste! A regular gym isn’t for me. I get bored easily. I walk in not knowing what machine to hit and, after 30 minutes, I want leave. I love the atmosphere of CKO classes: no pressure, a lot of fun. Biggest challenge: Getting the hang of the combinations. Once you have the technique down, next up is building strength and endurance to make it through the entire class. Best suited for: Someone who likes to switch things up. Highlight: The owners at my particular gym are extremely friendly. They teach, too. It makes you feel like you’re a part of a family. Unofficial uniform: An Under Armour tank top—I can’t workout in sleeves—my favorite pants and sneakers. The accessories are awesome, too: hand wraps and boxing gloves! Favorite sports bra: Panache Ultimate Maximum Control Sports Bra. It’s heavy-duty. Secret of life: Making time for yourself. Do what’s best for you. Passionate about: Having fun! I never want to be known as boring. On empowerment: It’s important to continue to grow in your life and career. Favorite network: I don’t watch a lot of TV but when I do, it’s HGTV. Style signature: A good bra, of course! Her fitness trend: Mud runs. I’ve done four MuckFest Mud Run 5Ks sponsored by the National Multiple Sclerosis Society because my dad has MS. We started doing fundraising walks with family and friends, then branched out into these obstacle courses. The scoop: You sign up on a team. We wear matching T-shirts; some people wear costumes. Then you slog through mud pits and dirty water, climb platforms and slide down poles, do rope swings, pull yourselves over walls and scale rope nets. I train by forcing myself to do a mile on the treadmill and working on my upper body strength. Why it’s so addictive: I’m not a runner, so the obstacles keep it interesting. The course changes every year. My friends and family don’t race to finish first, we do it to have fun and help each other. It’s an accomplishment. You don’t get this dirty and have this many laughs at the gym. Major motivation: My dad. It’s personal to me. Biggest challenge: The ruined clothes and sneakers! Best suited for: Someone who’s never done a race before and wants to test herself. Unofficial uniform: Under Armour T-shirts, HeatGear Compression Capris and headbands. Favorite sports bra: Don’t make me choose between Moving Comfort Fiona and Luna! Secret of life: Surround yourself with positive people. Travel. Be good to others. Like yourself. Passionate about: Connecting with others. I love chatting with customers. It’s very fulfilling when I can help her find something that works better for her—that can be life-changing. I never had a job before where I could do that for others. On empowerment: Be confident in everything you do. Favorite network: Bravo. Every time I flip it on, Andy Cohen has another show. Style signature: My friends make fun of me because I’m always wearing plaid. Best beauty product: L’Oreal serums, gels and mousses for my curly hair. Words to live by: Progress, not perfection. Her fitness trend: All kinds of yoga, including antigravity, where you’re suspended from a hammock three feet off the ground. It’s a fun, different way to experience yoga. You have to trust your body, overcome fear and build confidence. And you walk out feeling two inches taller! The scoop: A friend introduced me to yoga in 2005, and I just felt like I was home. Ashtanga, Bikram, Vinyasa, all of it. I got certified to teach in 2009. Yoga even inspired me to become vegan. I can’t imagine life without it. Why it’s so addictive: Depending on the day, you can push yourself to your limits or back off. It’s a way of taking care of your whole self, mentally and physically. Something happens to your mind, and you can feel those effects even off the mat. People started to notice my “yoga glow.” Yoga nowadays is an athletic workout, not all hippie-dippy. When I don’t go, I’m not a happy person. I feel like yoga is a recovery program—it gives you the tools to live a healthy lifestyle, to stay sane in this world. I go three times a week and meditate daily. I’m on a 519-day streak. Biggest challenge: Not switching to autopilot. You always have to have a beginner’s mindset, even when you’re the teacher. Some days I can’t do a pose I could do last time. There’s a fine line between pushing yourself and not forcing it. You have to observe where you are at that moment and learn to be OK with it. Best suited for: Anybody! My 81-year-old aunt wants to do chair yoga with me. Highlight: Yoga takes you to unexpected places. This year, my goal is to volunteer with Kula for Karma to teach yoga to cancer patients, veterans, inner-city schoolchildren and beyond. Unofficial uniform: A cute top like the Calvin Klein Performance Burnout Scoop Neck Tee and Compression Waist Leggings. Favorite sports bra: Calvin Klein Medium Control Reversible Wire-Free. On balance: Have some sort of spiritual or faith-based aspect of your life. Secret of life: Know who you are, and be that person. Passionate about: My hubby of 11 years and my fur-baby, Sophie. Current obsession: Mindfulness coloring books. They’re a fun way to relieve stress and get creative at the same time. Astrological sign: Aries, with a Scorpio moon and Virgo rising. Best beauty product: Aveda Control Paste helps to style my pixie cut without weighing it down.